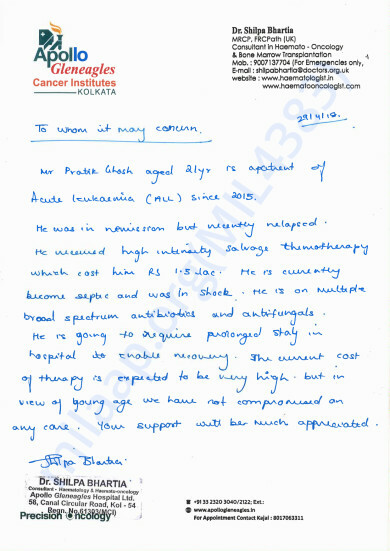 Pratik Ghosh, a 19 year old engineering (Electronics & Telecommunications) student in Techno India, Salt Lake, Kolkata, WB has been diagnosed with Acute Lymphoblastic Leukaemia(blood cancer, Refractory ALL) and is admitted at Apollo Gleneagles Hospital, Kolkata. He received 4 rounds of chemotherapy and is currently undergoing 5th round, to keep him alive. 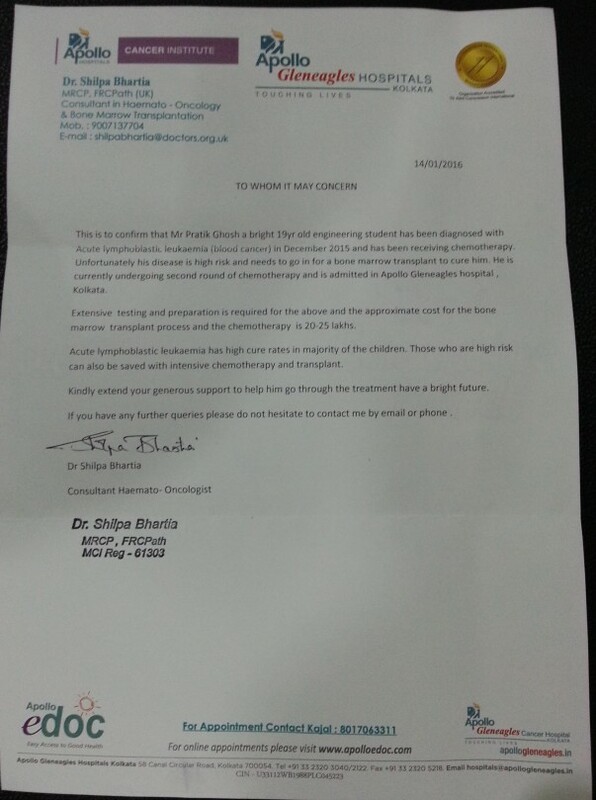 Being of young age, he stands good chance of cure with high intensive chemotherapy followed by bone marrow transplant. Being child of a financially week family and with no health insurance, only generous monetary help can be hope for his recovery. With the help of friends and relatives, the poor family already spent whatever they had and is currently have no funds to continue the treatment. Request you all to be kind to lend your helping hand to save the talented boy. Your small contribution can add up to a big amount. 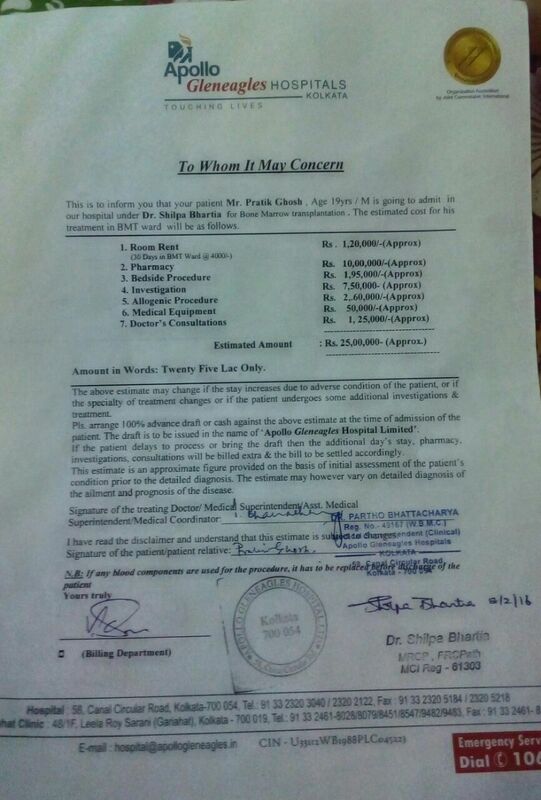 The amount will be used for his chemotherapy followed by bone marrow transplant. Thanks in advance and your help is much appreciated! 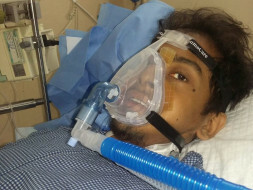 Pratik fought hard but he passed away on Friday, 4th May in late night hours. He had a relapsed leukemia for which he underwent chemotherapy too. He had developed severe infection because of which his health started deteriorating. His blood count also got extremely low. Doctors tried their best but they could not save him. We are grateful to all of you who contributed and supported us. Pratik is doing little better, however due to infection the fever is not entirely going and also blood counts are very low. Doctor is thinking to shift him out of ICU in next couple of days if the situation improves. However, he will need to stay at least another 10 days in hospital for recovery. The total cost will around 10 lakhs this time. Please keep supporting us. Thanks to all of you. Please share this campaign in your network and keep supporting and praying for him. 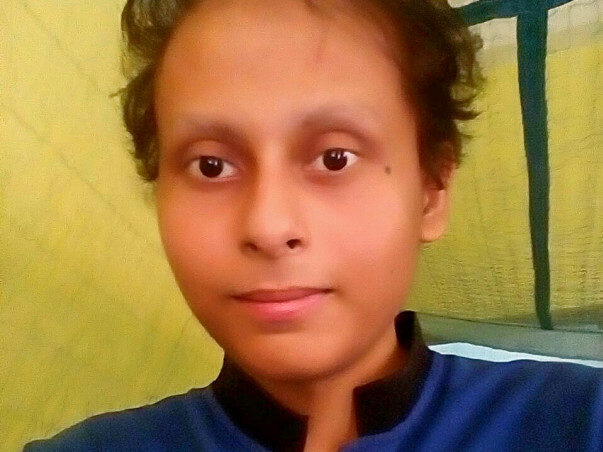 Recently Pratik's(a 21 year old engineering student in Techno India, Salt Lake, was getting ready to appear for his last semester exam starting 22nd of May, next month) blood cancer(leukemia, ALL) got relapsed and he went under one round of Chemotherapy, However his health severely deteriorated with severe body infection. Currently he is in ICU fighting with life with support system. At this critical hours, we are reaching out to you all for your generous support to the family so that Pratik's life can be saved. Please extend your help and contribute whatever you can. Thanks everyone for your support. Help to save him, please! Please forward this message to the maximum people possible so that a considerable amount can be collected for his continued treatment.